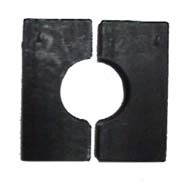 The dies are for use in our Large Diameter Hose Crimper. (LDHC) Order separate dies for each hose diameter. Crimps both aluminum or brass ferrules. We have the full line of ferrules and hose barbs to make repairing or building hose assemblies economical, fast & easy.